ELKHART LAKE, Wis. — Dirk Mueller was in a league of his own in qualifying Saturday at Road America, leading a Ford GT sweep of the IMSA WeatherTech SportsCar Championship GT Le Mans class front row for Sunday’s Continental Tire Road Race Showcase. Mueller lapped the scenic 4.048-mile circuit in two minutes, 1.422 seconds (120.017 mph) in the No. 66 Ford Chip Ganassi Racing Ford GT, an impressive 0.781 seconds ahead of teammate Ryan Briscoe, 2:02.203, in Ford Chip Ganassi Racing’s No. 67 entry. It was Mueller’s 20th career IMSA pole, second in a row at Road America and a class track record. 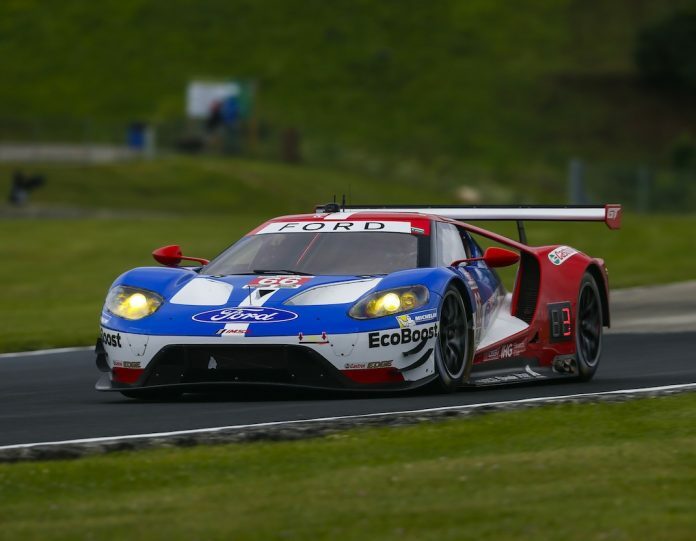 Ford Chip Ganassi Racing has certainly not been a stranger at the front of the GTLM grid this season with three of the team’s four full-time drivers having earned poles in seven races to date. While the Fords were undeniably quick again throughout the 15-minute qualifying session, BMW also continued to show the speed that has led to two wins and four consecutive podiums. Alexander Sims, who enters Road America second in the GTLM standings alongside co-driver Bill Auberlen in the No. 25 BMW Team RLL BMW M6 GTLM, qualified third, a mere 0.008 seconds behind Briscoe with a lap of 2:02.211. The team Sims and Auberlen are chasing in the WeatherTech Championship standings, the No. 3 Corvette Racing C7.R of Antonio Garcia and Jan Magnussen, qualified eighth. The duo enters the weekend with a seven-point lead over the No. 25 BMW team. It was a Lamborghini versus BMW battle for the GT Daytona class pole Saturday in qualifying for the Continental Tire Road Race Showcase at Road America, with the No. 16 Change Racing Lamborghini Huracan GT3 of Jeroen Mul ultimately prevailing over Jesse Krohn’s No. 96 Turner Motorsport BMW M6 GT3 for his first career TOTAL Pole Award in IMSA competition. The two drivers alternated fast laps throughout the final five minutes of the 15-minute session before Mul dropped the eventual pole-winning, and track record, lap of two minutes, 6.649 seconds (115.064 mph) with three minutes remaining. The TOTAL Pole Award was Lamborghini’s third this season, and the second career for Change Racing. Krohn was forced to settle for second with his lap of 2:06.851 around the 4.048-mile circuit, just 0.174 seconds behind the pole-winning time of Mul. Carrying the momentum from its first win of the season one race ago at Lime Rock Park, the No. 73 Park Place Motorsports Porsche 911 GT3 R of Patrick Lindsey qualified third with a lap of 2:07.149. Ricky Taylor claimed the pole in the Prototype class.